In the previous articles, I explained own to creates pattern-type for a single server, a master-slave and also how to add static scalability to a pattern-type. Now, if we want to have a dynamic scalability, a scalability which react on a monitoring feature, we have to be able to collect information from the server and this exactly what I will explain in this article. 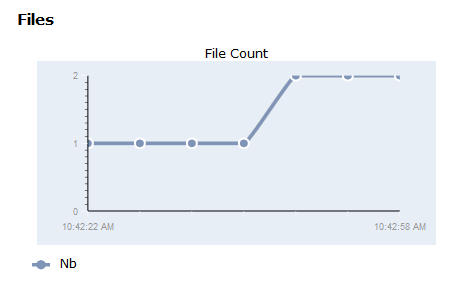 The final goal will be to be able to monitor the number of files in a given directory of a server and have a graph shown in the ‘Manage’->’Monitoring’->’Middleware Monitoring’. 1) Defining the format of the data that have to be collected in a metadata file. 2) Create the collector script which will collect the information on the server. 3) Create scripts which will upload the metadata file and the collector script on the server. 5) Provide configuration to the UI to show a graph representation of the collected data. We have to create a metadata file which will specify the format of the data send by the collector. This metadata file will be used by the IWD agent to parse the collected data. Because a metadata file can be used for multiple category we need to specify in the ‘category’ element the list of the category for which this metadata file will be used and for each category we have to define the metrics. In our case, the collector response will have to contain the attribute ‘nbFiles’ defined by the ‘attribute_name’. The ‘metrics_name’ will be the name exposed by the API and will have to be use when we want to reference this metric. We defined also the metric_type, here COUNTER. We will place this file in the /plugin/files/collectors directory of our plugin. Now, during the server installation we have to upload these files on the server and this is done by adapting the ‘install.py’ file of the role. First, we upload the files.sh in the /home/idcuser/collector directory, convert it in a unix format and make it executable. Secondly, we create the /home/idcuser/files, this is the directory to be monitored. Then, we upload the metadata file (Server-meta.json) and convert it in a unix format. We have to register the collector and this is done via the command ‘maestro.monitorAgent.register(). We will do that in the configure.py file of the role. It is important that the ‘role’ here is the concatenation of the node name + the role name (ie:Server-Server-12343454688.Server). The collector is the interface name that will handle the collector, here we choose the ‘script’ interface name. We have to specify the location of the metadata file, the location of the collector itself, the arguments for this collector (here the directory we would like to monitor), the valid exit code, a working directory and a timeout. Now, we have to create a monitoring_ui.json to show the graph and place this file next to the config.json file. This generates, after the deployment of a virtual application pattern based on this pattern-type, a graph in the ‘Middleware monitoring’ of the server which is updated periodically with the number of files located in the monitored directory. You can see, it is possible to add your own monitoring capabilities in a pattern-type with this we are on the right track for creating a plugin with an auto-scaling feature which will react on the number of files in a specific directory.